Oaks Meadow at Walcis Farm Estate is a typically Norfolk Constablesque landscape, with lovely hillocks offering uninterrupted views of the river Wensum, which winds its way sleepily through the centre of the site. Six of our cozy, stylish tents inhabit this stunning watery landscape. It is sooo quiet down here. You are literally miles from the nearest road, so the sounds of nature abound. The meadows themselves offer a wonderful open space for roaming and play and the surrounding estate attracts walkers and wildlife enthusiasts. It is the river, though, which is the star attraction here. With a launch from which to access the crystal clear water for a spot of wild swimming or canoeing, you can lose yourselves in dreamy days spent messing about by the river. Need supplies? Walk along the riverside path which takes you to nearby Lyng, or for added adventure, canoe there. The estate has an established 1920’s hotel on it’s perimeter where you can safely cycle to for a roast and private carp fishing is available on the estate by appointment. Leave your car and life at the gates, and take a dive deep into nature. 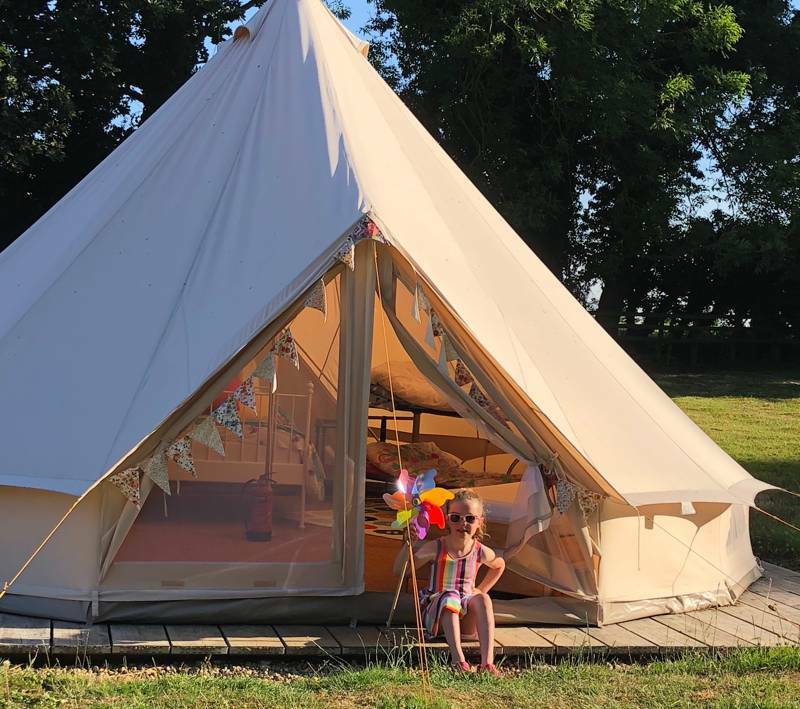 For latest availability and best prices for Amber's Bell Tent Camping at Walcis Farm, please use the Date Search above. 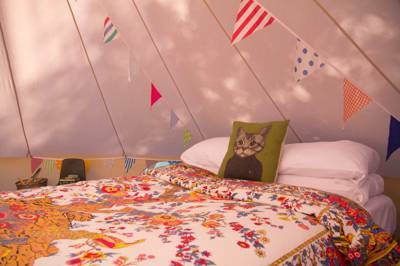 The cotton canvas bell tents are fully furnished, featuring single and double beds (depending on your needs) and all bedding and linen included. 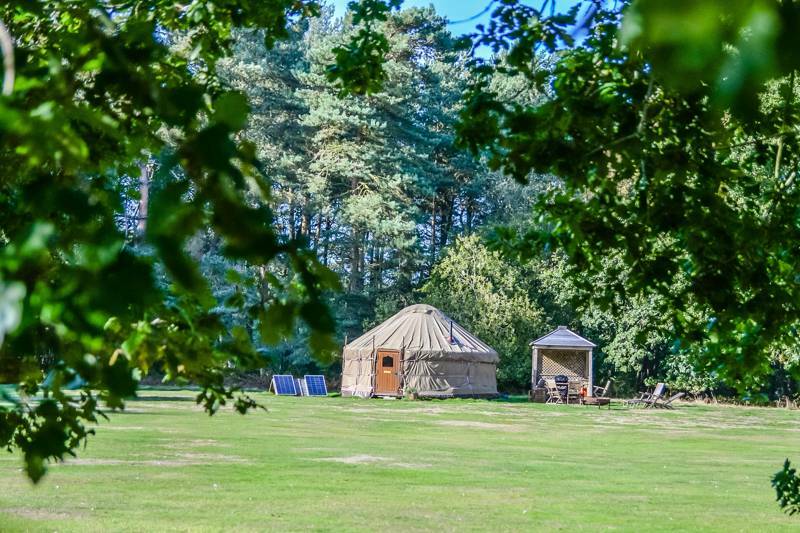 Wood burners, storage and soft furnishings inside, plus a kitchen box equipped with utensils and vintage dishware. 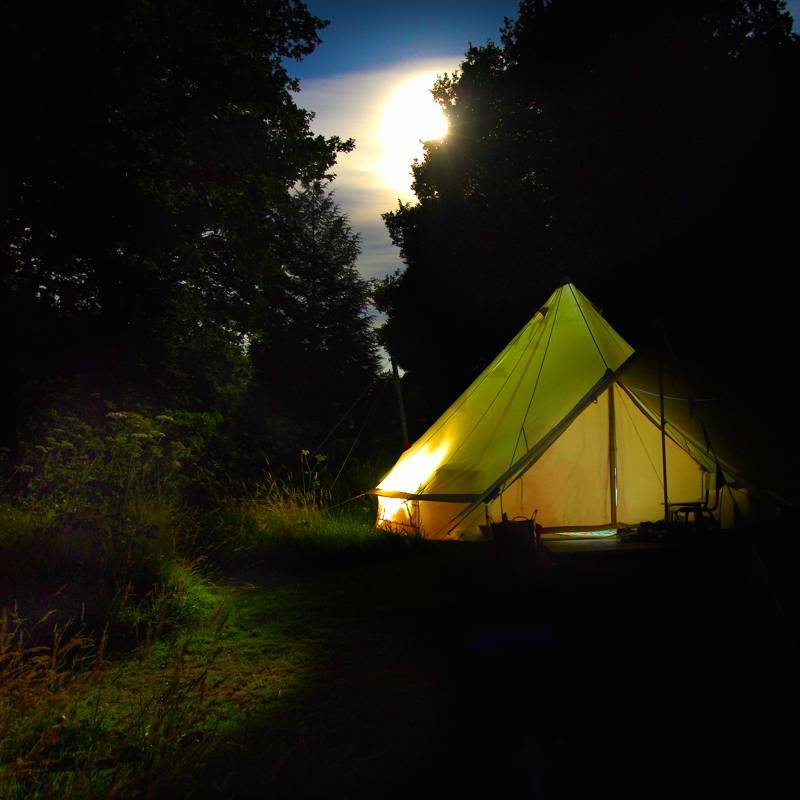 Outside each tent, you'll find a picnic table and fireside log seating and a BBQ/firepit. 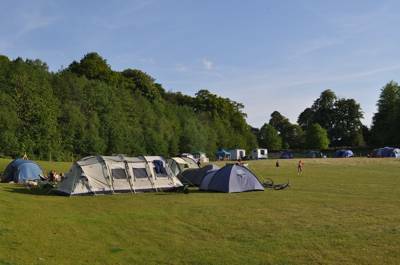 Brand new, private, lockable shower and toilet for each tent, plus a general washing station in the field for dirty dishes. There's also an onsite honesty shop for fire essentials, such as kindling, charcoal, firewood and candles. River access, with wild swimming, fishing (carp fishing on the estate by appointment) and canoeing all possible. Walk along the banks of the Wensum, wild swimming along the way – there's a good, 20-minute route to The Fox pub in Lyng – or bring bikes and try the nearby Marriots Way, which offers 26 miles of safe, family cycling along a disused railway track between Norwich and the market town of Aylsham. Norwich itself deserves a full day of your time; walk the old 'lanes' in the centre (full of independent shops, boutiques and cafés), visit the Norman castle (01603 493649), Romanesque cathedral (01603 218300) and the Sainsbury Centre for Visual Arts (01603 593199). 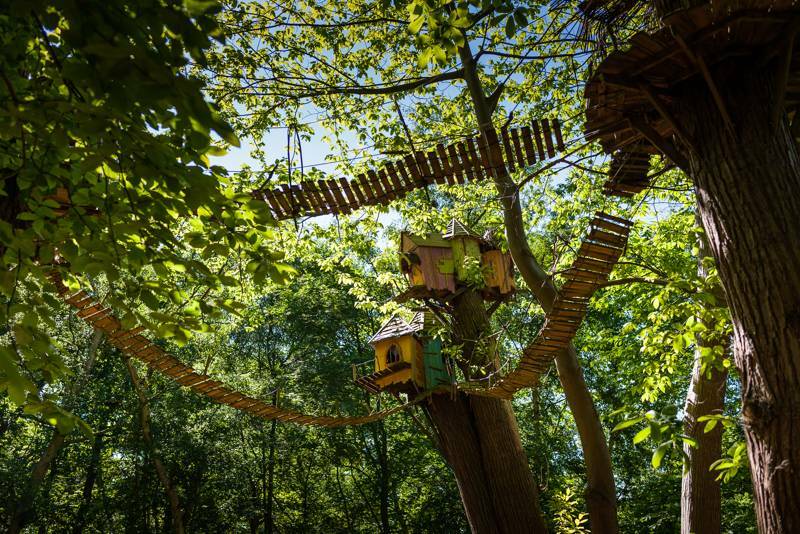 Within cycling distance of the glamping site, Roarr Dinosaur Park (01603 876310) has animal enclosures, a deer park and adventure trails for kids. It's a ½-hour drive to the nearest stretches of the North Norfolk Coast, where the beach and town of Wells-next-the-Sea and the National Trust-owned marshes around Blakeney and Morston are easiest to reach by hopping back on the A1067. For a treat, walk across the meadows or cycle to the Walcis Farm Estate entrance where you'll find the Lenwade House Hotel (01603 879567; booking advised), a magnificent timber framed building with a fine dining restaurant. For something a little more casual, walk in the opposite direction to The Fox (01603 872316) in the village of Lyng, with food from midday (except on Mondays) and a sunny beer garden. It’s a 5 mile cycle along the Marriott’s Way to Reepham, a slightly sleepy place but excellent for local food and with a picturesque square. Try Meloncaulie Rose for fresh fruit and vegetables and visit the truly atmospheric Dial House (01603 879900) for fantastic food all day in an old-fashioned dining room that’s adorned with antiques and collectables, many of which are for sale. Don’t leave without checking out the themed rooms downstairs. Walcis Farm is located on the A1067 between Norwich and Fakenham. The farm is the last entrance on the left hand side, if you’re coming from the Norwich direction (just after the village’s speed limit zone ends). 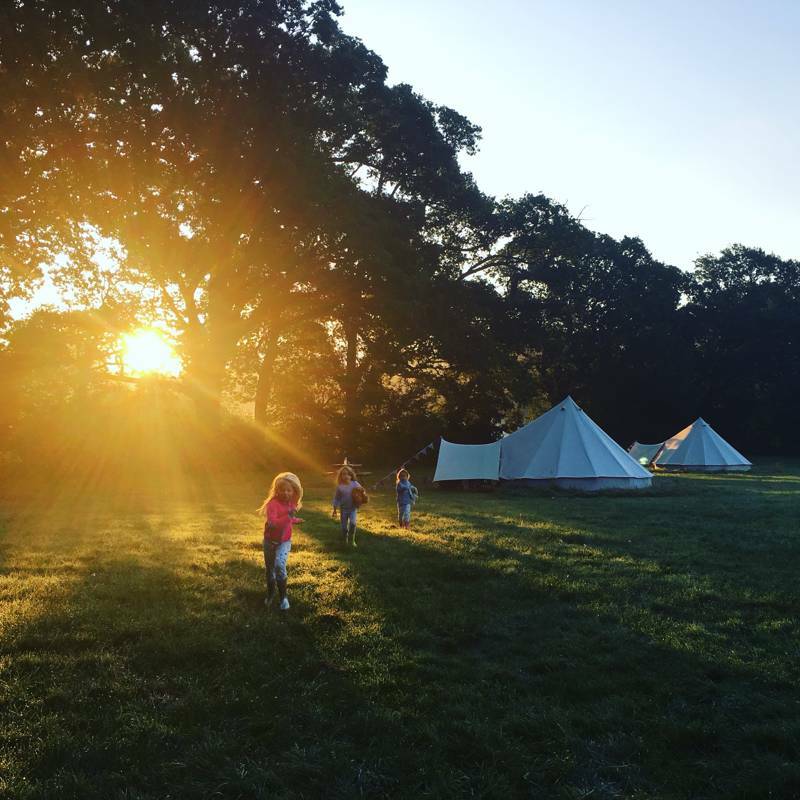 The farm drive takes you ½ mile through estate property, passed the farm house, where the road becomes a track and from which the tents are well signed. The nearest mainline station is in Norwich (trains run from here to the rest of East Anglia, while London Liverpool Street is 1¾ hours). From Norwich the X29 bus to Fakenham takes you through Great Witcham (50 minutes), where there is a bus stop about half a mile from the glamping site. Alternatively, a taxi from Norwich train station takes about half an hour. This is a glamping site with riverside access and, in places, the water is deep. The river is fenced off from part of the site – please get in touch with any concerns before you book.